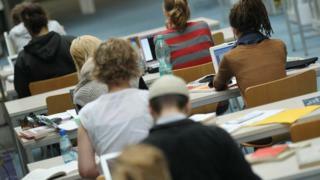 Staff at the Open University are likely to face job losses as the institution launches "a radical overhaul". A "root-and-branch review" aims to save £100m from an annual budget of £420m, said OU management in a statement. The changes would result in "a revitalised and redesigned OU", said vice-chancellor Peter Horrocks. "Changes on this scale will inevitably impact on staff," the university warned, and "in coming years fewer people will be needed overall". The OU was founded in 1969 to offer higher education distance learning to students who often did not fit the traditional undergraduate mould - many were older and studying part time while working. As the institution approaches its fiftieth year, management say their "major savings and reinvestment plan" will help it face the challenges of the next half century. "We want to transform the University of the Air envisaged by Harold Wilson in the 1960s to a University of the Cloud, a world-leading institution which is digital by design and has a unique ability to teach and support our students in a way that is responsive both to their needs and those of the economy," said Mr Horrocks. Staff make up two-thirds of the university's operating costs and the management say the number and types of roles will change, promising detailed work over the next six months to clarify the figures. But staff have urged university leaders to "come clean" on what exactly the plans mean for jobs. "Buzzwords about clouds and digital futures might work well for marketing purposes but mean little in the real world," said University and College Union general secretary Sally Hunt. "Staff are understandably worried about plans that appear not to have been thought through, and have little confidence in the next steps of the process. "How many staff will be affected and where?" Ms Hunt urged management to use the expertise of all staff to "reflect the full breadth of knowledge available within the institution". The OU is the latest in a series of universities to announce job cuts this year. The OU says its plans are, in part, a response to financial challenges. Over the past 10 years, it says, successive governments have introduced funding changes which have hit part-time student numbers. The OU's student numbers have fallen by almost a third with "a significant impact on income", costs have stayed the same and competitors are "cherry-picking" the most popular and profitable courses. The university says the redesign will tackle "duplication and inefficiency" and will deliver a "world-leading", streamlined curriculum, a major investment in technology and retraining for staff. "The OU will still be the OU. We will retain our core mission of offering higher education to all, regardless of background or previous qualifications. "But we will be delivering it in a different way, matching future needs to future technology," said Mr Horrocks. The OU currently has 170,000 students and employs 4,400 academics and support staff and 5,000 associate lecturers. Cuts to regional centres resulted in strikes by OU staff two years ago.